This green sauce started with sweet little baby radish greens but quickly morphed into a whatever-is-around-and-green-sauce. It can showcase any season, or any sad vegetable drawer. 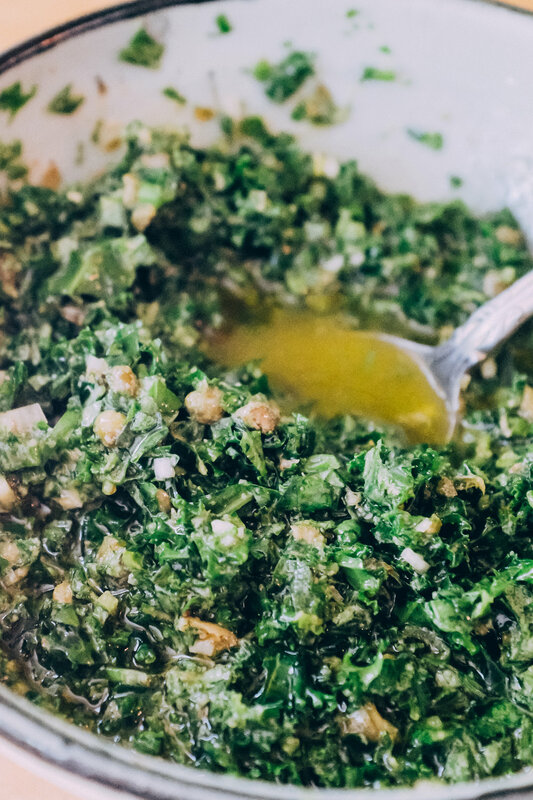 Almost like a bastardization of chimichurri and Italian salsa verde but with the charm of being handy and unfussy. I've used kale that's on its last legs, or fresh market greens, bitter dandelion or mustard greens or sharp radish and turnip greens. If it's dark green it will probably work. There's optional additions and subtractions, room to make it your own for what's on hand. After all, I'm a sauce girl. We are sauce people. I eat french fries for their function as a vessel, a sauce transport. If there is a way to get more sauce into my daily routine, I am there for it. Roasted lemons with vinegar - Toss lemons with olive oil and roast at 425 in a small pan. The pan can be crowded, a small skillet works well. Remove when dark on the edges 15-25 min. Immediately toss with apple cider vinegar. You can roughly chop for a rustic sauce or blend for something more creamy. Add the greens, spring onions, garlic, olive oil, lemon juice, mustard, lemon zest, and roasted lemons to a blender. Blend until combined but still slightly chunky. Season to taste. Roughly chop the greens and spring onion, add the charred lemons and chop until everything is small and well combined. Mix with olive oil, lemon juice, and mustard in a bowl. With a microplane grate the garlic and lemon zest into the mixture. Stir to combine. Season to taste. Chopped capers, red pepper flakes, chopped herbs (think basil, cilantro, parsley), vinegar (sherry or red wine), roasted garlic, nuts, coriander, cumin. With crudités, on sandwiches, as a salad dressing, on grilled meats, in a grilled cheese, tossed with rice, cooked beans or lentils. Honestly - eat this with everything. Green sauce is here to enhance.